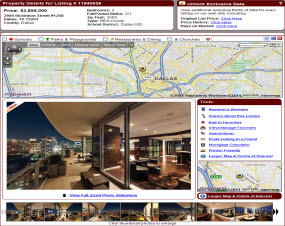 Dallas apartment rental and occpancy rates increased in March 2011 according to ALN Apartment Data, a company specializing in collecting, analyzing and reporting apartment and multifamily data. 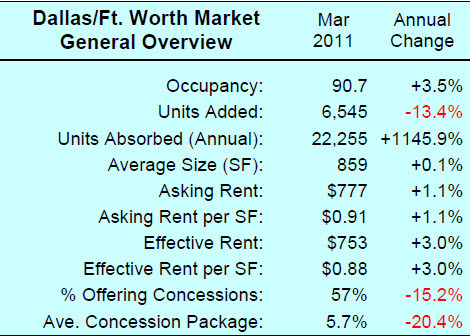 Dallas Occupancy rates increased 3.9% over March 2010. Effective rental rates in Dallas experienced an average increase of 3.2% with average rent at $782. Declining homes sales in Dallas seem to be fueling the Dallas apartment market and increasing occupancy rates and new multli-family apartment construction, which experieced a 23.3% annual growth in March 2011. Due to the high demand for apartments in Dallas and increasing occupancy rates, Dallas apartment communities are offering fewer and less appealing concessions to lure tenants to their properties. The percentage of multifamily apartment communities in Dallas offering lease concessions decreased 15.4%, which average concession packages decreasing 22%. 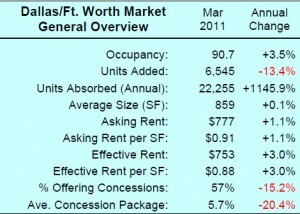 For more information on rentals in Dallas, check out March 2011 Dallas ALN Multifamily Report. DFW Urban Realty specializing in Dallas apartments including urban lofts, condos, townhomes, and high rises. 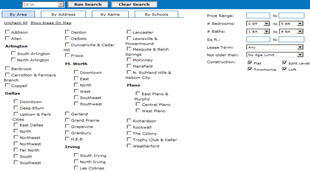 Ask one of our Dallas apartment locators about special rebates and incentives. Receive up to $500.00 Dallas apartment cash rebate for referring our Free rental locating service in Dallas.